More daylight = better Andrea. I cleaned up the toys scattered all over the sun porch, and tossed them in the boxes that were already there. you can see the floor, which is good, because this gives us room to start digging out Christmas decorations. Two of my neighbours have lights on theirs house already. Aside from being able to reach the holiday items, and sort them over a bit, this also means we can start going through boxes of toys. Broken ones to chuck, along with garbage, toys to keep, toys to go to other kids. Emma’s almost ten – there’s a lot of toys she’s no longer interested in. 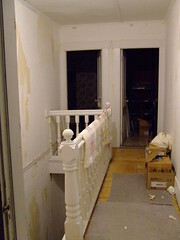 Also, given some holiday cleaning, and earlier bedtimes, the other night Ron was done on the computer early, took one look at the upstairs hallway on our side and could not stand the peeling wallpaper any longer. Looks so much better, and it is so much brighter it’s almost unbelievable. That was pretty light wallpaper too. Click through the picture for a few more. We also did one wall in the office, the one with the heart wallpaper. I also made a couple coasters for the desks in our office. These have the super thick but not high batting that is also heat resistant. Can’t remember what it’s called, but it was nice to work with. Then I worked on a wall hanging Mom had made for me, but I sewed an entire section wrong and had to unpick it. 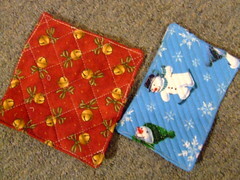 But I also sorted out what I could do with two different quilt tops, so that evened it out.